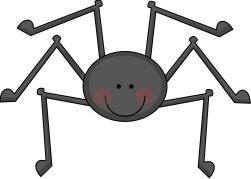 Racky the spider spun her web in the corner of Cindy’s kitchen by the broom closet, where nobody could see her. Racky was afraid of people. People scream when they see spiders. The loud noise makes the tiny hairs all over her body vibrate. When her hairs vibrate, Racky gets scared. Racky liked to watch Cindy and her family from her corner in the kitchen. Cindy and her brother Matt had invitations to a Halloween party. Matt cut up cardboard boxes to make a robot costume, and glued aluminum foil on top. Cindy glued leaves onto one of her dad’s old t-shirts so she could look like a tree. Racky wanted to go to the party, too. She wanted to be a ghost. She spun herself a snug little white ghost costume leaving room for all eight of her spindly spider legs to stick out the bottom. She thought – I can spin a thread over the doorway and drop down onto Cindy’s costume when she goes out the door. I’ll get to go to the party, and nobody will scream at me. Racky waddled along the ceiling. It was hard to walk gracefully in her ghost costume. She perched over the doorway, and spun her thread ready to drop onto Cindy when she walked underneath. Matt came to the doorway. The aluminum foil on his cardboard robot costume crackled. He walked stiff-legged, making his shoes go clump clump against the wood floor as he walked. The door handle clicked and a breeze pushed the door open. Matt stomped out onto the sidewalk. The breeze rustled Cindy’s leaves. She waved her arms like branches in the wind. Racky attached her sticky white thread to the lintel, ready to push-off with all eight of her spindly spider legs. Her thread was stronger than steel and more flexible than silk. It could hold her weight even though she was extra heavy with her ghost costume. Cindy put one foot over the threshold. She glided down, down on her lovely silken thread. A gust of wind blew a leaf off Cindy’s costume. Cindy dashed back into the living room to catch the leaf. Racky stopped gliding down, and started climbing back up her silken thread to wait for Cindy. Just then, Cindy’s mother, who always screamed at spiders, stepped through the doorway. Cindy’s mother’s ear caught on Racky’s web. Racky found herself dangling from Cindy’s mother’s left ear, like an earring. Racky was so startled, she hung onto her thread for dear life, all the way to the party. At the party, Matt showed off his robot costume. Clomp. Clomp. Clomp. Crinkle Crinkle. Crinkle. Cindy showed off her leaf costume. Rustle. Rustle. Racky thought – “look at me! Look at me I’m wearing a costume, too!” She wiggled in her ghost costume as she dangled from Cindy’s mother’s ear. Then she remembered -- if people saw her somebody would scream, but it was too late. “I didn’t put on any earrings,” said Cindy’s mom. Racky tried to pull her legs up inside her costume. But they wouldn’t fit. Someone was going to see her. Someone was going to scream. “Are you sure?” asked Cindy. The hairs on Racky’s body vibrated so fast she shook all over. She looked like a dancing ghost hanging from Cindy’s mother’s ear. Racky had never heard anybody scream that loudly before. Racky felt sorry for her – she sounded even more scared than Racky felt. Cindy’s mother batted at her ear. She screamed again. Racky’s hairs vibrated. Racky hung onto her ghost costume as tightly as she could with all eight of her spindly legs. Racky’s silk thread came loose from Cindy’s mother’s ear. Her ghost costume acted like a tiny parachute. She flew through the air, costume and all. Racky had never been so scared in her life. She landed on Cindy’s shoulder. Cindy picked Racky up gently in her hand. She saw the hairs vibrating all over Racky’s body. “You scared the spider,” she told her mother. “Fair is fair,” said Cindy’s mother. She scared me, too. “It’s fun to be scared on Halloween,” said Matt. Racky looked around at the party and she agreed. The story was an interesting and fun story. It was a fantastic story and I liked it. This is the best story have ever read in by whole life. My daughter and I laughed non stop it is a beautiful story. this was a really great story.i liked how the author included family membersv as the main characters in the story as well as racky the spider.the overall story plot and the setting was fantastic as well.kids of all ages will enjoy this story.keepm up the good story telling. Halloween is my favorite holiday! Great story!